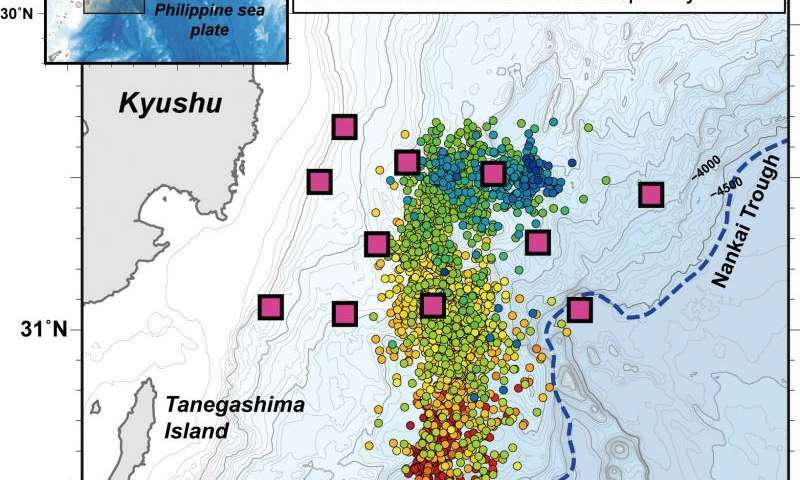 A University of Tokyo research group has discovered slow-moving low-frequency tremors which occur at the shallow subduction plate boundary in Hyuga-nada, off east Kyushu. This indicates the possibility that the plate boundary in the vicinity of the Nankai Trough is slipping episodically and slowly (over days or weeks) without inducing a strong seismic wave. It was thought that the shallow part of the plate boundary was completely "uncoupled," being able to slowly slip relative to the neighboring plate. However, after the 2011 Great East Japan Earthquake, it was discovered that is not entirely correct, and it is very important, in particular in the Nankai Trough, an area in which a major earthquake is expected, to understand the coupling state of the plate boundary. Hyuga-nada is located off east Kyushu in the western part of the Nankai Trough, a highly seismically active area in which M7-class interplate earthquakes occur every few decades, but interplate slip at the shallow plate boundary in this region is insufficiently understood. A research group comprising Project Researcher Yusuke Yamashita, Assistant Professor Tomoaki Yamada, Professor Masanao Shinohara and Professor Kazushige Obara at the University of Tokyo Earthquake Research Institute and researchers at Kyushu University, Kagoshima University, Nagasaki University, and the National Research Institute for Earth Science and Disaster Prevention, carried out ocean bottom seismological observation using 12 ocean bottom seismometers installed on the seafloor of Hyuga-nada from April to July 2013. The research group discovered migrating (moving) shallow low-frequency tremors which are thought to be triggered by slow episodic slipping (slow slip event) at the shallow plate boundary. The shallow tremors had similar migration properties to deep low-frequency tremors that occur at the deep subducting plate interface, and that they also occurred synchronized in time and space with shallow very-low-frequency tremors that also thought to be triggered by slow slip events. These observations indicate that episodic slow slip events are probably occurring at the shallow plate boundary in the vicinity of the Nankai Trough. After the 2011 Great East Japan Earthquake, a fundamental review of the shallow plate boundary interface is required. These new findings provide important insight into slip behavior at a shallow plate boundary and will improve understanding and modeling of subduction megathrust earthquakes and tsunamis in the future.